The beach in Marazion is where a prophecy was fulfilled in 1471 when Sir John Arundell, the Sheriff of Cornwall, was killed. 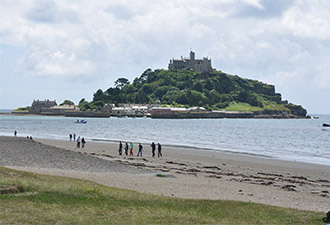 He was leading an attack to retake St. Michael’s Mount, which was under the control of Richard de Vere, Earl of Oxford. According to Coxe, an earie phantom hitchhiker was reported at Marazion Green. It took the form of a White Lady that would jump onto the horse of a passing traveller, and ride pillion as far as Red River before mysteriously disappearing. St Michael's Mount (Cornish: Karrek Loos yn Koos, meaning "hoar rock in woodland") is a small tidal island in Mount's Bay. It is linked to the town of Marazion by a man-made causeway of granite setts, which is passable between mid-tide and low water. It is under the care and management of the National Trust. The castle and chapel have been the home of the St Aubyn family since approximately 1650. The earliest buildings, on the summit, date to the 12th century. This is the very place of legend. The archangel Michael is said to have appeared here to fisherman in 465AD as a warning of the rocks. The island is associated with the giant Cormoran, who built the island and was killed by a hero known as Jack-the Giant-Killer. Pictured left is St Michael's Mount courtesy of Nilfanion. For further information, please read Ghosts: Mysterious Tales from the National Trust by Sian Evans. Marazion (Cornish: Marhasyow) is a civil parish and town in Cornwall, England. It is situated on the shore of Mount's Bay, two miles east of Penzance and one mile east of Long Rock. Pictured left is a view of Marazion courtesy of Tony Atkin. Licensed under CC BY-SA 3.0 via Wikimedia Commons.